The global management consulting industry is growing. In 2015, America's management consulting sector grew by over seven percent, hitting almost US $55 B. In the UK, it expanded by over eight percent, topping £6.7 B. Several factors are driving that growth, while at the same time creating challenges the industry has never before faced. For many management consulting firms, professional services accounting practices keep them on top of the growth wave and also keenly aware of emerging industry intricacies that might otherwise impede their forward progress. The management consultant brings a wealth of real-world resource to any project, and they are often hired specifically because their experience outside the project's parameters will enhance and improve project activities within those parameters. However, the management consultant service is no longer a stand-alone aspect of any given project. Rather than assessing and analyzing project activities from an isolated perspective, today's management consultant is expected to engage with an ever-growing body of project-related entities. partnerships with outside organizations and even other consultants. Most importantly, despite the complexities of the work and the demands from the client, the management consultant must still offer a fair and reasonable pricing schedule that encompasses the expanded management expectations as well as the high value of their services. Professional Services Automation accounting software is often the tool these professionals use to accurately record and track all their intricate management consulting details. The biggest challenge presented to many management consultant professionals is the reality that each consulting project contract is uniquely different from every other project, and so it requires an equally unique fee structure and invoice template suited to the specifics of that project. Adding to the challenge is the fact that many of the details included in each fee schedule are often outside the control of the professional, such as prevailing market rates and high or low demand for this specific professional service. Consequently, many consulting professionals find it difficult to establish a settled template upon which to develop truly customized fee schedules that are able to incorporate all the potential variables that may arise within any individual contract. As is the case for many of today's industry challenges, technology is available to resolve the problems faced by management consultants as they work to both set and track their fees over the life of the consulting contract. The cloud-based professional services automation and accounting software offered by Beyond Software has the flexibility and comprehensiveness demanded by the busiest of consulting professionals. 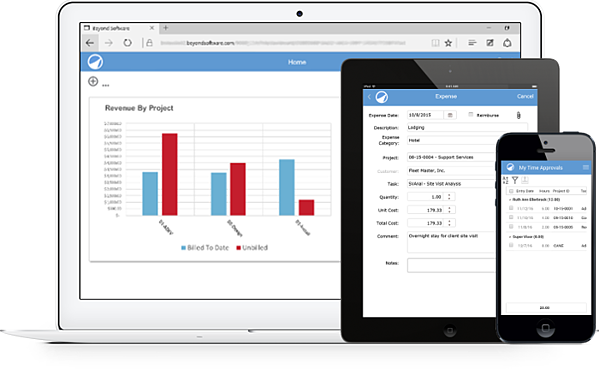 Separate modules manage project specifics, such as financial management, time and expenses, and billing and invoicing, while intuitive dashboards keep the professional up to speed on all relevant project developments. And because the software is cloud-based, it can scale up or down depending on the resources involved in the project, or across any number of projects. Keep your management consulting firm at the forefront of the industry by using Beyond Software’s professional services automation software for all your management consulting contracts.